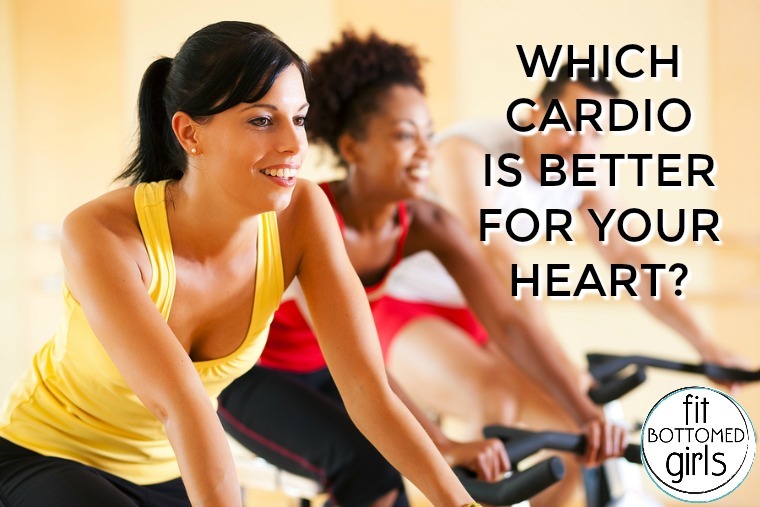 HIIT or LISS: What’s Better for Your Heart? Boy, do I love me some cardio. And you should to. Think about it: of all the muscles in your body, none is as important as your heart. It’s the only muscle that never gets to stop contracting … well, at least not if you wanna stay alive. It’s a pretty well-known fact that heart disease is the leading cause of death in this country. According to the surgeon general you should be getting 150 minutes per week of moderate exercise (like brisk walking or bicycling) or 75 minutes per week of more vigorous exercise (like running or group fitness classes) or some equivalent mix of both. For years, the debate over whether HIIT (high intensity interval training) or LISS (lower intensity steady state) is better has raged on. When asked, I always say it depends on what your goals are. If your goal is to build a powerhouse of a heart then listen up, I’m about to break it down for you — strictly in terms of heart health. HIIT workouts, also known as or interval training or metabolic conditioning, involve short bouts of high intensity (hard) work followed by a periods of rest. HIIT is mostly anaerobic which means that during exercise your body is fueled primarily by stored carbohydrates rather than relying exclusively on oxygen. By doing HIIT exclusively as your cardio work, you might believe that your heart is fitter than it actually is because when you venture outside of the aerobic (oxygen-fueled) zone, you’re not actually getting the full cardiovascular benefits. Additionally, due to the intensity, a HIIT-only diet can actually strain your cardiovascular system and stress out your heart out. Too much HIIT can also negatively affect your nervous system and trigger symptoms that look and feel like anxiety — elevated heart rate, sleep disturbances, lack of focus, agitation and restlessness — all of which just continue to stress your heart out. LISS is a term used to describe an activity that’s performed at a consistent, steady effort for an extended period of time. The intensity is lower and that’s what allows you to maintain the activity for longer without the need for rest in the middle of the workout. Since LISS keeps your heart rate in the aerobic zone, it’s fabulous for conditioning your heart and improving blood pressure and circulation. Because of this, LISS causes your resting heart rate to decrease — a signal that you’re heart doesn’t have to work so hard just to pump blood to the rest of your body and keep you alive. LISS is much easier on the body so it’s excellent for beginners and can be done more frequently than HIIT without stressing out your ticker more than it’s able to bounce back from. The point of LISS is to place just enough strain on your heart to make it have to adapt and get stronger but not so much that it freaks your heart out. HIIT and steady state cardio are both great ways to get fit. In a perfect world, you’d include a little of both but if you could only pick one and your goal was purely heart health, I’d suggest LISS. While HIIT certainly has its pros — shorter workouts and awesome metabolism-boosting effects — but when it comes to heart health, nothing beats the aerobic benefits of LISS. Now, I know that LISS isn’t nearly as glamorous as HIIT, but if you needed another reason to include a little more LISS in your life, here you go: in order to do HIIT, your ticker has to be strong enough to recover between high-intensity bouts … this is a function of your aerobic system. In other words, by doing LISS you strengthen your heart in ways that will ultimately improve your performance during your HIIT workouts because those hard efforts rely heavily on your aerobic system to get your heart rate back down during rest intervals. I loved this post and your blog. Great fitness ideas. For so many years LISS was the ugly twin of the exercise world with many people doing it incognito. I’m glad to see it coming back into the front of the pack for health as walking is a fabulous way to get those steps in and moving in the right direction. Heart diseases in people are increasing day by day and also leading cause of death. So it should be our priority to take care of us and our loved ones. Proper diet, exercises play’s an important role in curing heart diseases. Very informative article thanks a ton. Once again the phrase “everything in moderation” comes to mind. Get your LISS but don’t live and die by it. Get your HIIT but again don’t make it your only thing. In general don’t make cardio your only form of exercise. Make sure you get in some resistance training and also stretching. Each of these is a component for balanced health, simple as that.